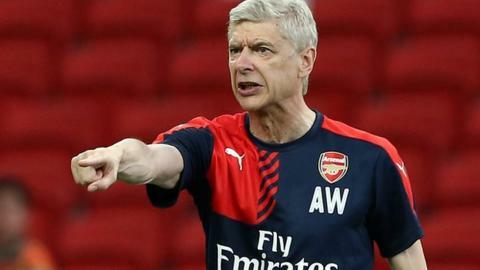 Arsenal manager Arsene Wenger has dismissed suggestions that he could sign almost any player in the world. Club director Lord Harris made the comments in the Daily Mail, saying Wenger has the financial backing to break the club's transfer record. "He's gone a bit overboard. It's not true," said Wenger, who signed Petr Cech from Chelsea this summer. "We are in a situation where we are working hard if an opportunity comes up to do something." Lord Harris said that, after a period of financing the Emirates Stadium, money is now available to buy almost any player in the world, with £200m in the bank. "Apart from Lionel Messi and Cristiano Ronaldo, he could have any player," he said. Wenger, who has been Arsenal manager since 1996, has guided them to three Premier League titles and five FA Cup wins. They went nine years without winning a trophy before lifting the FA Cup in 2014 and 2015. Wenger signed Germany midfielder Mesut Ozil for £42.4m in September 2013, breaking the club's transfer record by £27.4m. He then spent £35m on Chile forward Alexis Sanchez last summer. "We are in a strong position with a strong squad I am happy with. If the opportunity turns up, we could still do something," said Wenger. "We are in a strong financial situation, a healthy one, and it is down to focus on football and the quality of our players - as well as the quality of the players we could still get in - and not too much on the amount of money, which looks sometimes spectacular." With only Sanchez and Olivier Giroud scoring 10 or more league goals last season, Arsenal have been linked with numerous strikers this summer. But Wenger has instead called on other players in his squad to contribute more goals. "I think we have enough goals in the squad," Wenger added. "What we want is some more goals from some players who are not really strikers. That was our strength traditionally. "Our target is to improve our number, but you have examples of teams who have scored 90 or 100 goals and have not won the championship. We want to combine good defensive efficiency with 10 more goals."